The TAFO is not right or left specific. Why does the TAFO cover so much of the calf area? 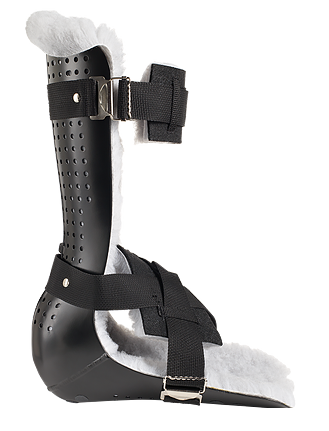 This supports the foot and ankle well for the best possible outcome. How do the buckles work? Pull the strap end over the buckle to loosen the grip. Turn the straight edge buckle like a key in the hook to unlatch. To hook, place the straight bars buckle in the hook and pull webbing to tighten. See Buckle Illustrations. Why are PFS Med products made of metal instead of plastic? The hospital grade alloy is malleable, yet strong and can be modified for dressings or patient size. How can the TAFO be customized? Can the TAFO accommodate an external fixator? Yes. We offer a modified TAFO (called our “EF series”) that accommodates distal bilateral external fixation. Please contact us for additional customization and modification information. Can the TAFO be walked on? The TAFO is designed for crutch or walker touch-down to weight of leg weight bearing. Can the liners be washed? Yes, machine wash and line dry. See Sizing. It is very important that the splint not rub the back of the knee (popliteal space) with full bending of the leg. What codes should be used for the TAFO?